Started in 1969, the Kite & Bike Festival is a Boston tradition that gathers more than 1,000 people at Franklin Park each May to enjoy picnicking, kite flying, bicycles & music. Picture endless blue skies dotted with colorful kites, children and families running and laughing across bright green fields — the Franklin Park Kite & Bike Festival is not to be missed! 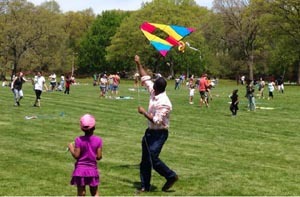 Traditionally the Saturday after Mother’s Day, last year’s event drew 3,000 people to the park to fly kites and picnic. Come celebrate our own “opening day” in Franklin Park at the Kite & Bike Festival on Saturday, May 18, 2019 from 11 am to 4 pm. 2019 Community Partners: Bike with Kids – Roxbury Way, Boston Cyclists Union, Bluebikes, Playworks, Appalachian Mountain Club’s OutdoorsRX, Lena Park Community Development Center’s FabLab (DIY Kite-making) & MORE! Getting There: Biking, walking, and transit are encouraged! There will be limited parking available adjacent to the Playstead at the Giraffe Entrance to the Franklin Park Zoo. Vendors, please contact us (617-442-4141) to learn of opportunities and help support the annual Kite & Bike Festival. Free, but vendors and volunteers welcome! Plug your address into our Interactive Map to find the best way to the park! By Bus: MBTA bus #16 stops at the main park entrance on Blue Hill Avenue, while the #22, #24, and #49 stop at Seaver Street & Humboldt Ave or Seaver & Elm Hill Ave entrances. By T: Take the Orange Line T Station to Green Street or Forest Hills station. Click here for detailed walking directions and map. By Bike: Bike with Kids Group Ride: Grab your helmet and bike for a fun filled bike ride through Roxbury. Join Bike with Kids on their 1st annual ride, starting in Dudley Square and ending at the Kite & Bike Festival. For more details and to register, visit roxburyway.com.